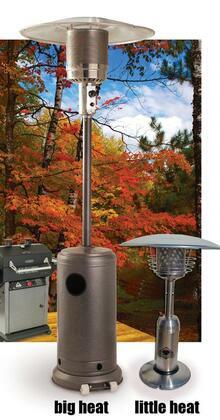 Perfect for those fall grilling nights, Holland's Patio Heaters provide the extra heat. Available in a full size hammered finish or the sleek, stainless table top model, you have your choice to fit your need. The full size model (BHA5001) stands over seven-feet tall and offers up to 43,000 btu's of heat. It has a hammered finish that matches the cabinet-model Holland grills and operates off a standard 20 lb. LP cylinder. Standing just over three-feet, the table top heater (BHA5008) is perfect when you just want "heat for two." This powerful portable beauty will provide up to 11,000 btu of heating power and operates efficiently on a one-pound disposable LP cylinder. Either way, you'll stay warm while your Holland does all the work. Order one today!